Evansville and Hammond, Indiana – An intellectual property attorney for Joe Hand Promotions, Inc. of Feasterville, Pennsylvania filed two Indiana lawsuits, one in the Northern District of Indiana against Robert J. Matijevich and UDL, LLC, both d/b/a L F Nortons, of Lake Station, Indiana and the other in the Southern District of Indiana against John Backes and Backes Frontier, LLC, both d/b/a New Frontier Restaurant and Bar, of Evansville, Indiana. Both lawsuits allege that defendants illegally intercepted a satellite signal and broadcast protected content. 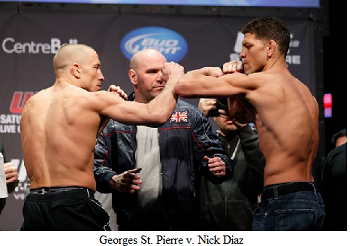 Joe Hand Promotions, a commercial distributor of sporting events, asserts that it was granted exclusive domestic rights to the commercial distribution of the Ultimate Fighting Championship 158: Georges St. Pierre v. Nick Diaz (“program”), which was broadcast on March 16, 2013. Two recent complaints were filed by the intellectual property lawyer for Joe Hand Promotions in federal courts in Indiana. In each complaint, both the business entity that owns the accused establishment and an individual charged with responsibility for that establishment’s operations have been named as defendants. The allegations against the defendants include such wrongful acts as interception, reception, publication, divulgence, display, exhibition, and “tortuous” [sic] conversion of the program. Joe Hand Promotions asserts that the acts were “willful, malicious, egregious, and intentionally designed to harm Plaintiff Joe Hand Promotions.” As a result of these alleged acts, defendants have been have been accused of violating 47 U.S.C. § 605 and 47 U.S.C. § 553. Each complaint also lists a count of conversion. Joe Hand Promotions seeks statutory damages of $100,000 to $110,000 for each willful violation of 47 U.S.C. § 605; $10,000 for each violation of 47 U.S.C. § 553; $50,000 for each willful violation of 47 U.S.C. § 553; compensatory and punitive damages on the claim of conversion; costs, including costs incurred for the service of process and the investigation of potential wrongdoing; and attorney’s fees. The case in the Southern District of Indiana was assigned to Chief Judge Robert L. Young and Magistrate Judge William G. Hussmann and assigned case number 3:15-cv-00028-RYL-WGH. The Northern District of Indiana case was assigned Case No. 2:15-cv-00093. No judicial assignment has yet been made for this case.